Spectacular views from high on top of the cliffs of Princeville. 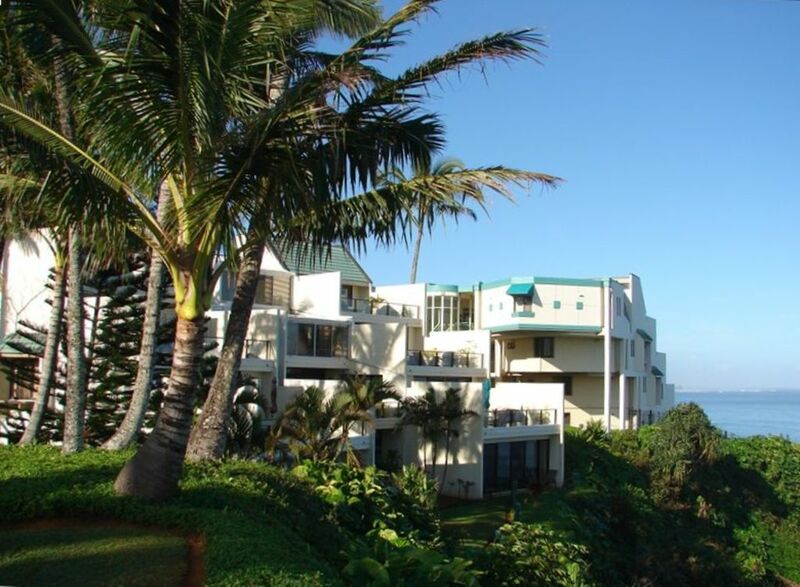 This top-level condominium is terraced at the edge of the bluff, commanding unobstructed blue Pacific Ocean views, including Hanalei Bay. Easterly trade winds caress the property with refreshing tropical breezes year round. Enjoy romantic sunsets backdropped by mountain waterfalls. There is no better way to enjoy the romance and warm charm of the garden isle of Kauai than in Princeville. Whether you travel for the amenities of the resort or choose to enjoy the natural wonders of the island or maybe just to relax, then your choice is Pu'u Po'a #402. This spacious unit is completely equipped with all the amenities one would expect in a world-class property. The recently installed custom glass solarium over the atrium provides additional living space to be enjoyed just a single step from the master bedroom suite or from the comfortably furnished living room. The newly remodeled interior is beautifully decorated to the highest standards. Bolivian rosewood hardwood flooring, quality furniture, exquisite oriental rugs, gourmet kitchen, granite counters, cherry cabinets, custom linens and dramatic appointments throughout. Simply the best! Complete entertainment center, Samsung 50' SMART TV, Sony HD TV, DVDs, Stereo, private phones, high speed internet and ceiling fans in every room. Optional AIR CONDITIONING is always available utilizing the latest advanced technology. Note: Unit #402 provides separate A/C controls to the main living area and to both bedrooms, something rarely found in any Pu'u Po'a unit. Directly below the property is a pristine, white-sand beach accessed by a marked pathway. Swim, snorkel, sun bathe, or simply relax the day away. Princeville is a planned resort community overlooking the Pacific Ocean where lush, green mountains meet crystal-clear waters with beautiful uncrowded beaches. The resort's centerpiece is its award-winning, 27-hole, championship golf courses. Shopping opportunities abound in the Princeville Center with everything from a supermarket to art galleries and a full range of services including a bank, activity office, and a public library. Dreams seem to come true while enjoying the magical moments in Kauai. Pu'u Po'a #402 is the perfect blend of luxury for the vacationer who expects the very best. As an owner, I suggest and encourage my clients to email me through the OWNER LINK "send email" for more information. Reservations less than 7 nights reverts to a $450 nightly rate unless fewer than 7 nights are open, then the rate would be $410 for those available nights for two people. Extra guests, $25 per night per person, max occupancy 4. Stays longer than 12 nights require a $125 mid stay cleaning. Phone 603-488-5033. Gary and Anne Ekdahl.... Enjoying the scenic beauty and tropical breezes of Kauai has always been our desire. Recently retired as a Captain for American Airlines allows Anne and I the unique ability to frequently travel to our favorite destination. The breath-taking location of the North Shore of Kauai, with it's spectacular views of mountains and ocean forms the backdrop for this one-of-a-kind property. The quality of the interior of the top floor #402 sets it apart from other choices. The unique features include Bolivian rosewood flooring, a real glass solarium over the atrium, gourmet kitchen, marble and granite accents, exquisite oriental rugs, tasteful artwork. Plus...AIR-CONDITIONING! First class accommodations for the vacationer who expects the very best. Large walk-in shower with multiple shower heads in master bathroom. Carved birds of paradise glass blocks. Marble vanities. Second bathroom with full size tub/shower. Marble vanity. High efficiency LG washer and dryer. Two wireless phones with recorder. Free calls on island and to USA mainland and Canada. Optional. 3-Zone latest technology, extremely quiet, split duct system. Actual electric usage only on A/C line is recorded and subtracted from security deposit upon your departure if used. High efficiency LG full size washer and Dryer. Laundry detergent provided. Comfortable sofa and love seat plus reclining leather chair. Extensive stoneware collection plus Noritake China service for more formal dining. Adjoining dining area, seating for six. Adjacent center island with barstool seating for four. Large Samsung 'Smart TV' plus Sony TV in M/B. Large Samsung 'Smart TV' HD flat screen plus Sony blue-ray DVD. Sony stereo surround sound. Bose mini wifi music connection for smart phone. Sony amplifier, 4 speakers and subwoofer. Rentals available 10 minutes from condo in town of Hanalei. All types of water gear available 10 minutes from condo in town of Hanalei. Free tennis court. 4 racquets provided. Nearby Makai Golf course, 18 holes plus a 9 hole course. No elevators. Access requires stairs. Spectrum high-speed internet service. Gourmet kitchen fully equipped, custom cherry cabinets, beautiful granite counters. Master bath features marble and carved birds of paradise glass. Custom glass solarium creates beautiful spacious interior. We had the pleasure of staying in the Ekdahl's lovely condo for a week, returning home on April 6th. I didn't want to leave! Our party consisted of my daughter, son-in-law, my husband, and myself. The condo presents just as the pictures show. It has plenty of space, lovely finishes, and amazing views. You can see the mountains, with their lush jungles, and tropical flowers out the front door, and see an expansive view of the ocean from all of the living areas inside the condo. It was well stocked, and if you choose, has everything you need to prepare meals. We took advantage of some of the other things provided as well, such as beach towels with mats to set them on, tennis racquets and balls, and even snorkel gear. The property itself is in the perfect location. We loved the feel of Princeville, and Puu Poa is set nearly at the end of the road, nextdoor to the Princeville Resort. There is a steep path adjacent to the pool, that leads to Hideaways beach below the condo. We did not access that, as my husband has mobility issues. There are stairs that go down to the beach below the Princeville resort, and an elevator inside that they so graciously allowed us to use somy husband got to enjoy the beach, too. The Princeville shopping center is just a couple of minutes away, complete with restaurants, shops, and a Foodland grocery store. Hanalei and Kilauea are just a short drive away and have many fun restaurant options. Gary has been a very gracious and responsive host from start to finish. I couldn't recommend this condominium and location more. I was happy to have the time to drive around the island, and wouldn't consider staying anywhere else but the North shore. Summed up in one word, paradise. Mahalo for the wonderful stay! We appreciate you devoting the time to create a detailed account of your recent experience. Honest reviews help others to know they will receive value in their choice for accommodations. We are pleased that you and your family had a wonderful time. Four of us spent 12 days in Kauai at this beautiful condo in Princeville. Excellently furnished and equppied go meet all your needs. Phenomenal view of the Pacific. Would recommend to anyone wanting to be on North Shore. Lovely, comfortable spot; don't miss Hide-a-way Beach! We had a lovely time in our 5 nights at this condo. The furniture and decor are wonderfully done and very comfortable. When the weather was good (which was most of the time), we took every advantage of all the nearby activities and sights. When it wasn't (on our last day), we sat on the deck and watched rain squalls blow in, then watched whales breach in the storm. Hide-a-way Beach is a gem, and just down the (fairly steep) hill. If you need easier access to a beach, the Princeville Resort beach is open to the public and just down some steps on the other side of the point. Both beaches are swimmable, but this will always depend upon the surf. Our kids enjoyed the pool and tennis courts. We enjoyed the books, puzzles, and games. The condo is equipped with everything you could need, right down to the spice drawer and laundry soap. The owner has placed quite a few tastefully scripted signs around to remind guests how to care for the house, and given the lovely floors and finishes, this seemed to us most appropriate. Although we stayed in January under partly cloudy skies much of the time such that air conditioning probably wasn't ultimately necessary, I did enjoy running it at night in the master bedroom. Most other units at this facility are not similarly equipped, and someone with my temperature preferences probably would want this amenity available during the summer months. Gary, the host, happened to be just leaving when we were arriving and was most hospitable. He kept in touch by email during the stay and thought ahead to kindly offer us late check-out, which we happily took advantage of. Anne and I thank you for posting a detailed impression of your recent trip to Kauai. The chance of meeting a client during our departure is rare so it was a welcomed occasion to meet your lovely family. I'm pleased everyone enjoyed the amenities for it is our goal to anticipate your needs while providing upscale accommodations. I'm hopeful you will return to once again experience the scenic beauty of the island while staying in a property that does not disappoint. As all the other reviews say: Great view, home, location, cleanliness, decor, setup for activities (e.g. Beach equipment). Owner very easy to work with. Only minor issue was DSL internet, dropped off often for periods each day. If you need to work during stay, you will be using cellular data often. We are pleased you enjoyed the amenities and your experience in #402. The island speed on DSL has its limitations. The unit will be switched over to Cable internet beginning in December 2018 which should provide faster internet. Perfection! Definitely the most beautiful place we have ever stayed. Impeccably furnished with everything needed for our stay. We only wish we could have stayed longer. Thanks for an unforgettable stay. Thank you for taking a moment to share your impressions. We strive to provide a level of detail that every guest will appreciate with no disappointments. .The comfort and quality makes for wonderful memories. Optional A/C always available utilizing the latest technology. Separate KW meter records actual usage, if any, then only that cost amount is subtracted from the security deposit. Only one of two condos with A/C in second bedroom. Separate controls for main living area, master bedroom and second bedroom. NOTE: $450 per nt. reservations less than 7 nts. Hawaii Tax ID #W30001206-01 Holiday rate, December 20, 2019 through January 5, 2020, $3500 per week for 2 people. $25 ea./nt. additional person Processing fee $95 per week. No additional charge for check or Venmo. Ck-in time 3 pm., Ck-out time 10am All stays of 12 nights or more require a mid-stay cleaning of $125 that will be included in the agreement.